Addenda to the 2015 Revised Edition. The 2015 Revised Edition of Crime Fiction IV is now available on CD-Rom. The price remains the same as for previous editions, $49.95, and can be ordered from Bill Contento through the Locus Magazine website. 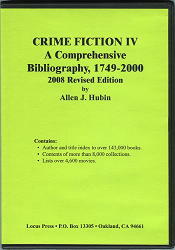 Unfortunately this will be the last CD-Rom edition of Crime Fiction IV. All future changes and additions will be listed only on this website through a continuing series of addendas. These addendas have been appearing on this website for the past 10 years, but since all of that information is now included in the 2015 Revised Edition, it will no longer be directly accessible from this starting page. Below is Part 1 of these new addendas. Links will be added for Parts 2 and on as they are created. To SEARCH for a specific author, title or phrase anywhere in the various parts of this Addenda, there two ways to most effectively use Google: (1) Do a normal search on Google but add crimefictioniv (or crimefictioniv.com) as one of the words sought. If searching for an author’s name, it is suggested that you do not use quotes. (2) Go to the Advanced Google search page and procede as directed, but be sure to include crimefictioniv.com in the box provided for the domain to be searched. Most of these entries represent new information, and such entries contain additional information to provide some bibliographic context. Those entries below that are also included in the CD-ROM do not generally provide the context information. I thank John Herrington in England, as a great deal of the new information has been provided through his industrious and ingenious researches. ALLEN, JOHN. 1922-1994. Pseudonym: Paul Geddes, q.v. ARMSTRONG, [CAPTAIN] F(RANCIS) CLAUDIUS. Served in the Sardinian Navy; prolific author of naval adventure stories; other sources indicate he was born in Ireland in 1802. ARRIGO, FRANK. 1917-1977. See: Frank Arrigio. ASKEW, ALICE (JANE DE COURCCY). ASPINWALL, MARGUERITE. Add: ...but buried in Nyack, New York. AVANTIERE, SYLVESTER. Pseudonym of Michael (Angelo) Avallone (Jr.), q.v. B. and R. This, for “Helen Elwood, the Female Detective; or, A Celebrated Forger’s Fate,” was probably the pseudonym of Walter Besant, 1836-1901, and James (Samuel) Rice, 1843-1882, both in CFIV for titles under their own names and jointly. BAKER, RICHARD (MERRIAM). Add: died in Montclair, New Jersey. BARKER, RONALD (DE LA BERE). 1889-1965. Born in Christchurch, New Zealand, and died in Tanganyika; lived also in Australia and England; went to Tanganyika after WWI and was a hunter and safari organizer there. BATES, MARGARET HOLMES (ERNSPERGER). Pseudonym: Mrs. M. E. Holmes, q.v. BEATTY, BETTY JOAN CAMPBELL SMITH. 1919-2014. BEECHAM, ROSE. Pseudonym of Jennifer Knight, 1958- . Other pseudonym: Jennifer Fulton, q.v. BENEDICT, CLAIRE. Benita Brown, 1937-2014. BENNETT, CHARLES. The title listed for this author, “Fox on the Run,” was by Charles (Alfred Selyn) Bennett, 1899-1995, and should be moved to his entry in CFIV. BENTHAM, JOSEPHINE ALENA. Add: died in Volusia, Florida. BLACK, DON. Pseudonym of Donald Blackstone, 1938- . BLACKSTONE, DONALD. 1938- . Pseudonym: Don Black, q.v. BLAYRE, CHRISTOPHER. See also: Selina Dolaro. BLOCK, HARRY CARL. Born in New York City; died in Tarrant, Texas; an oil man. BLOOM, SARA. 1893- ?. Pseudonym: Sally Chayes, q.v. BOOTH, CHARLES G(ORDON). Add: also a screenwriter who won an Oscar for “The House on 92nd Street.” See also: Ahmad Kamal, 1914-1989. BOWER, MARIAN. Died in London (correction). BRAND, (CHARLES) NEVILLE. SC: Henry Barradyne = HB. BREEN, PHILIP. Chester (W.) Krone, (Jr.), 1935-2013. The Mystery of the Hermits’ Cave. Note: This appears to be a book for children/teenagers. BRITTON, ANNE. Former fiction editor of “Women’s Own” and author of romances under the pseudonym Jan Andersen. See: Catherine Dillon. BROWNE, DIANE L. 1957- . BURTT, J(OHN) DOUGLAS. 1947- . (Adding first name and birth year for the author of “Senseless” in CFIV. CAMERON, DONALD CLOUGH. Add: prolific script writer for comic books; died in New York City. CAMPBELL, HAZEL (MARY FAITH MARLOW). 1891-1950. Add: died in Craignish, Argyll, Scotland. CAMPBELL, SIR MALCOLM. A racing driver who once held the land (1935) and water (1937) speed records. The Towers of Urbandine. (5-act play.) (Identifying the nature of this 1805 publication in CFIV.). CECIL, ALLAN. Pseudonym of C. A. Lewis, who lived in Horsham, England; very likely Cecil Allen Lewis, 1921-2006. CHAMPION, JOAN [AUGUSTA JOANNA MAY CHAMPION MATTHEW SOMERVILLE]. 1888-1969. Born in Launceston, Tasmania; died in Bournemouth, Dorset, England; married Charles Matthew in Singapore, then Robert William Somerville in Gloucestershire. (Adding dates and biographical detail for the author of “Incidental Murder” in CFIV.). CHANCELLOR, JOHN. Other possible Rideaux pseudonym: Barbara Heygate, q.v. CHANDLER, MAURICE CRESSWELL. 1902-1996. Possible pseudonym: Maurice Cresswell, q.v. CHARD, JUDY. Dorothy Doreen Chard, 1916-2014. CHARLES, HAMPTON. Roy Peter Martin, 1931-2014. CHARLES, ROBERT. SC: Judy Kane, in title marked JK and subsequent novels. CHARLES, SPENCER. Ellen Spencer Danser, 1922-2013. CHESTER, ALAN. 1916-1994. Born in Perth, Australia; a theatre manager; died in western Australia. CLARKE, JOSEPHINE FITZGERALD. 1866-1953. Born Josephine Fitzgerald Moylan in Galway, Ireland; married Sir Frederick W. A. Clarke in 1893. CLELAND, R(OBERT). A Scottish novelist. (Adding biographical detail for the author of “A Rich Man’s Relatives,” an 1885 novel in CFIV. CLEMENCE, BRUCE. 1953- . (Adding the birth year for the author of a 1991 pamphlet, “-No Way Street,” in CFIV. CLIFFORD, READ. SC: Major Heysham and Peter Pater, in both titles. COLEMAN, (FINLEY) CARTER. 1961- . CONNOR, (PATRICK) REARDEN. Pseudonym: Patrick Malin, q.v. CORBETT, DESMOND. See: Ace Capelli (“Never Turn Your Back”). CROOKENDEN, ISAAC. (Adding a title for the author of numerous other titles in CFIV. Vivian Morgan’s First Case. Show publication date as: 1940. CURTIS, RICHARD (ALAN). Delete reference to pseudonym Ray Lilly. DALTON, PRISCILLA. Add pseudonym: Sylvester Avantiere, q.v. What Dread Hand. Correction: Show publication date as 1956. DANE, MARK. Add pseudonym: Sylvester Avantiere, q.v. DAVIDSON, MRS. DAN M. Lived in Detroit. DAY [LEDERER], LILLIAN. 1893-1991. Birth name: Lillian Ethel Abrams; married someone named Day, then Lyon Mearson, 1888-1966, q.v., then Norbert Lederer; died in New York City. DAYMONT, JOHN. No trace of the book listed in CFIV, “The Pelota Murder”, can now be found, so it may be a ghostly title. DEAN, ELIZABETH. Born Elizabeth Harriet Baker in New York City; lived in Council Bluffs, Iowa, from 1930. DE ANGELIS, E. L. Although the play in CFIV under this byline, “The Green Pigeon”, was published in the U.S., the only matching full name for the author is Eugenie Louisa De Angelis, 1878-1943, born and died in London, England. Dean of Clonbury. Since the book was apparently published as by Peter Roche, the title in CFIV is moving to that entry, q.v. DE LISLE BROCK, H(OPE). 1883-1922. (Adding the first name and dates for the co-author, with Phyllis Bottome, of “-Crooked Answers”, a 1911 novel in CFIV. DE PRE, JEAN-ANNE. Add pseudonym: Sylvester Avantiere, q.v. DOBSON, CECIL COURTENEY. 1862-1898. Possible pseudonym: Cecil Courteney, q.v. DOLARO, SELINA. Both titles were ghost-written by Edward Heron-Allen, 1861-1943, q.v. DONFORD, PHIL(IP). For the author of “The Sakavamaka Revolt” in CFIV, the byline is probably a pseudonym, since no trace of such a person can be found. DOYLE, BERTHA CECIL. 1886-1961. Probable pseudonym: Cecil Haworth; name also given as Cecil Raworth. DUNNE, COLIN. Diane L. Browne, 1957- . The Red Invader. Apparently reset and revised and published thus by Macdonald in 1947. FAIRBANK, JANET AYER. Died in Wisconsin. FINLEON, PATRICK CHARLES. Ellen Spencer Danser, 1922-2013. FISCHER, JOHN. Ruel Edward Fischmann, 1939-2013. FITCH, A(BIGAIL) H(ETZEL). Born in New York City; died in Stockbridge, Massachusetts. FLUKE, JOANNE. Ruel Edward Fischmann, 1939-2013. FORRESTER, MRS. JOHN [FRANCES EDITH WOODS FORRESTER]. 1848-1907. Born in West Bromwich, England; family went to Australia in 1852. FREEBORN, PETER. Pseudonym of J. Leon Israel, 1933- . Other pseudonyms: Alexandra Frye, Peter Israel, qq.v. FRIEDMAN, BARRY. 1916-2014. Add: graduate of Lafayette College and New York University School of Medicine; served as medical officer on a destroyer in the Pacific during WWII; had further training in orthopedic surgery; served on orthopedic staff of Mount Sinai Medical Center, Cleveland, and as professor of orthopedic surgery, Case Western Reserve University; after retirement was a consultant in San Diego, where he died. FRYE, ALEXANDRA. Pseudonym of J. Leon Israel, 1933- . Other pseudonyms: Peter Freeborn, Peter Israel, qq.v. FULTON, JENNIFER. Pseudonym of Jennifer Knight, 1958- . (Correction.) Other pseudonym: Rose Beecham, q.v. GEDDES, PAUL. Pseudonym of John Allen, 1922-1994. GEER, SHERRILL. Pseudonym of Shirley Geer Guralnick, 1935- . GEORGE, HELEN (PORTER). 1877-1914. See: W(alter) L(ionel) George, 1882-1926. Olga Nazimov and other stories, with Helen (Porter) George, 1877-1914. GILPATRICK, NOREEN [NOREEN GILPATRICK SMITH]. 1935-2012. Born in Pensacola, Florida; died in Mesa, Arizona. GLAYDE, ELIZABETH. (Deleting approximate birth date; surname very uncommon, and no dates traced; also in CFIV for “-Guilty Fingers,” 1937.) See also: Philip (Howard Handley) O’Farrell, 1883-1943. GOLDBERG, HERSCHEL. 1901-1980. Pseudonym: Harry Grey, q.v. GOLDMAN, RAYMOND LESLIE. 1895-ca.1959. (Correcting the approximate death date.) Probably died in Nashville, Tennessee. GOVAN, ALLAN. Delete possible dates and middle initial for author of “Pearls of Death and other stories” in CFIV. GRAHAM, LEWIS. 1900-1983. See: Lou Goldberg, 1900-1983. GRANBY, GEORGE. (Deleting the tentative 1900-1977 dates for the author of “The Secret of Musterton House”, a 1929 novel in CFIV.). GRANGER, VIVIAN (HECTOR). 1919-1984. (Adding birth year for the author of “The Desperate Days” in CFIV. GRIFFITH, EMERSON JASON. 1883-1964. See: Mr. and Mrs. E. J. Griffith. GRIFFITH, WINIFRED M. TWOHY. 1892-1973. See: Mr. and Mrs. E. J. Griffith. GURALNICK, SHIRLEY GEER. 1935- . Pseudonym: Sherrill Geer, q.v. HAIN, MARY JEN(N)IFER. 1921- . Pseudonym: M. Hayne, q.v. HARDEN, ELIZA. 1868-1943. See: Elizabeth Harden. Heat Wave. Delete the movie reference; the book was a novelization of a screenplay by Herschel Weingrod that was never filmed. HART, MAX. Pseudonym of (William) Macgregor Urquhart, 1916-1967, q.v. HAYS, LEE. Correct dates from 1914-1981 to 1930- . HEALY, J(EREMIAH) F. (III). 1948-2014. HERON-ALLEN, EDWARD. See also: Selina Dolaro. HIGHLAND, DORA. Add pseudonym: Sylvester Avantiere, q.v. HILL, ALBERT FAY. 1925-2014. Born in Hindsville, Arkansas; died in Denver, Colorado; graduate of Depauw University and Union Theological Seminary; chaplain at the U.S. Military Academy, West Point; pastor at several Presbyterian Churches; crusader against organized crime; cancer researcher. HILLIARD, (WILLIAM) MAURICE. 1931-1992. Born William M. Tweddle in Morpeth, England; legally changed his surname to Hilliard in 1955; died in Newcastle-upon-Tyne. HIMMEL, RICHARD (C.). (Adding details for two of the numerous titles in CFIV by this author. HINCKLEY, JULIAN. Library of Congress gives a 1905 birth date for the author of the 1946 novel “Murder by Schedule” in CFIV. However, no such author/birth year can be traced, and the “notorious murder” on which the story is said to be based also cannot be traced. So the author’s name may well be a pseudonym. On the other hand, if LOC got the birth date wrong, there was a writer/novelist/playwright Julian Hinckley, 1884-1955, born and died in New York, with whom no direct connection to “Murder by Schedule” has been found. Mystery remains. HOBART, L. C. Apparently was in London in 1924, but no one of this name can be traced. Fade Into Murder. Correct Australian publication to Shakespeare Head, Sydney, under the same title. Murder Makes Headlines. Delete reference to this title, which seems not be have been published as a book. HONEYMAN, WILLIAM CRAWFORD. Add: born in Wellington, New Zealand, to emigrants from Scotland; mother Eliza (a dress maker and later operator of a boarding house) took him and three other children back to Scotland in 1849; he married Annie Cassels in 1872 and fathered six children, only one of whom lived to adulthood; teacher of violin and author of books on the instrument; died in Scotland. HOPE, RICHARD. Pseudonym of E. P. Williams, 1929- . The Great Amherst Mystery. Delete; this is a book about psychic phenomena. HULBURD, PERCY and TENNYSON (LAUNCELOT) SMITH, 1858-? IRBY, CHRISTIAN. She was either Louisa Christian Fellowes Irby, 1874-1942, or her daughter Christian Geraldine Mary Irby, 1914-1967. ISRAEL, J. LEON. Add pseudonyms: Peter Freeborn, Alexandra Frye, qq.v. ISRAEL, PETER. Add pseudonyms: Peter Freeborn, Alexandra Frye, qq.v. JACKSON, JACK. SC: Frederick Wardson, in both titles. JACOBS, T(HOMAS) C(URTIS) H(ICKS). SC: Det. Insp. Ruggles Radford = RR. JONES, (MALCOLM HENRY) BRADSHAW. 1904-1989. JOSEPH, F. J. Author’s real anme given variously as Fritz Josefovics, Fritz Joss and Frederic Joss. Born in Vienna, Austria, in 1908; died in Hong Kong in 1967. KAMAL, AHMAD, 1914-1989, and CHARLES G(ORDON) BOOTH, 1897-1949, q.v. KEIRSTEAD, B(URTON) S(EELY). D(onald) Frederick Campbell, 1906-1992. KENYON, PAUL. Donald (C.) Moffitt, 1931-2014. KILLIAN, DIANE. Diane L. Browne, 1957- . KNIGHT, JENNIFER. 1958- . Born in New Zealand; living in the Midwest (U.S.). Pseudonyms: Rose Beecham, Jennifer Fulton, qq.v. KRONE, CHESTER (W., JR.). 1935-2013. LAFFEATY, CHRISTINA. Add: Born in Johannesburg, South Africa; died in Hertfordshire, England. LAMOUREUX, NANCY. SC: Marian Bradbury, in both titles. LANGLEY, SARAH. 1927-2014. Add: born in New York City; had a Ph.D. in Anthropology and Archeology; participated in numerous archeological digs; died in Branford, Connecticut. LAWRENCE, DAVID. David Henry St. Lawrence Morris, 1920-2013. LEDERER, NORBERT (LEWIS). Born in Vienna of American parents; died in Paris; chemical engineer, chess player and author. LEWIS, C. A. Probably Cecil Allen Lewis, 1921-2006. Real name of Allan Cecil, author of two novels in CFIV under the pseudonym. LEWIS-BOWEN, KATHLEEN. 1911-1981. Pseudonym: Parr Cooper, q.v. MacGREGOR, RICHARD. Add pseudonym: Max Hart, q.v. McNEILE, MICHAEL (A. M.). 1916-1983. MALIN, PATRICK. Pseudonym of (Patrick) Rearden Conner, 1907-1991, q.v. MAMALIS, KATHLEEN B. 1923- . Pseudonym: Mary K. Mamalis, q.v. MAMALIS, MARY K. Pseudonym of Kathleen B. Mamalis, 1923- . MANN, JOSEPHINE. Josephine (Mary Wedderburn) Pullein-Thompson, 1924-2014. MANUEL, DAVID (BURTON, JR.). 1936-2013. A Christian author; graduate of Yale; served in the Naval Air Force; founder of publishing imprints; popular voice on Salem Radio in Boston; author of the two books listed in CFIV and two more later in the same series. MARITANO, ADELA (KALOUSEK). Born in Chicago; died in Santa Cruz, California. MARTIN, JANE. 1937- . Born Yvonne Jane Curry in Bournemouth, England; married John Martin in 1967, then Raymond Hatton in 1997; living in Cornwall. MELVILLE, JAMES. Roy Peter Martin, 1931-2014. MICHAELS, STEVE. Add pseudonym: Sylvester Avantiere, q.v. MIX, TERENCE (JOSEPH). Victor J(oseph) Rosen, 1933-1988. MORGAN, ROBERT. C(hristopher-John) J(ames) Henderson, 1951-2014. MORGAN, WYNN L. Chester (W.) Krone (Jr.), 1935-2013. MORRIS, DAVID HENRY ST. LAWRENCE. 1920-2013. MURPHY, PATRICK T(HOMAS). Ref: CA. NILE, DOROTHEA. Add pseudonym: Sylvester Avantiere, q.v. NOONE, EDWINA. Add pseudonym: Sylvester Avantiere, q.v. O’CONNOR, ALISA ZINOVYEVNA ROSENBAUM. 1905-1982. Pseudonym: Ayn Rand, q.v. OLIVER, JOHN RATHBONE. Add: had degrees from Harvard (A.B. ), University of Innsbruck (M.D. ), Johns Hopkins University (Ph.D.) and General Theological Seminary; professor at several universities; on clergy staff of Mount Calvary Episcopal Church in Baltimore; had a reputation as a criminologist through work as a psychiatrist in the Baltimore courts; a collector of rare books, and a novelist. OPENSHAW, GEORGE HARRY. 1882- . Birth in Birmingham, England, registered as George Henry Openshaw; probably died in Kenya, to which he sailed in 1946, apparently intending to live there. ORIOL, LAURENCE. Noelle Loriot, 1925-2009. PARK, WILLIAM R. (SR.). Author, columnist, teacher, lecturer, and past president of three advertising agencies. PARKER, ORIN (DEAN). 1923-2014. Born in Parker, Idaho; died in Oceanside, California; had several postings overseas (Athens, Greece, Ankara, Turkey, Baghdad, Iraq, and Beirut, Lebanon); active in American Friends of the Middle East and eventually president of the organization; author of several novels. PARROTT, (KATHERINE) URSULA. 1899-1957. Born Katherine Ursula Towle in Boston; graduated from Radcliffe College; married Lindesay Marc Parrott in 1924, then Charles Terry Greenwood in 1932, then John J Wilberg in 1934, then Alfred Coster Schermerhorn in 1939 (divorced 1944); died in poverty in New York City. PHILLIPS, ARTHUR. Toronto advertising executive. PINCHERLE, ALBERTO. 1907-1990. Pseudonym: Alberto Moravia, q.v. PRITCHARD, STUART (MARSHALL). 1921-2014. Born in Hagerman, New Mexico; died in Roswell, New Mexico; served in the Army Air Corps in WWII; operated McDonald’s restaurants after the war; political cartoonist and historian. PULLEIN-THOMPSON, JOSEPHINE (MARY WEDDERBURN). 1924-2014. PYKARE, NINA (ANN) COOMBS. SC: Kate Kettering, in “Death Comes for Desdemona” and subsequent novels. RAND, AYN. Pseudonym of Alisa Zinovyevna Rosenbaum O’Connor, 1905-1982. RAYNOR, MOLLY. 1903-1976. Born Molly Rayner in Dunedin, New Zealand; married John McIntosh Beattie; death in Australia registered as Mollie Beattie. REED, MORTON (CLIFFORD). 1932-2012. Born in Brooklyn; died in Las Vegas; psychologist, screenwriter, film executive, and entrepreneur who lived many years in Los Angeles. REEVES, ROBERT. 1912-1945. Add: was serving with the 500th Bomb Command in the Philippines when he died. REILLY, HELEN. Birth name: Helen Margaret Kieran. ROCHE, PETER. This was identified by WorldCat as the pseudonym of Malcolm Hincks. Presumably this was not Cyril Malcolm Hinck, in CFIV, since he died in 1954. Other possibilities include Walter Malcolm Hincks, 1884-1960, Victor Robert Malcolm Hincks, 1915-1985, and Reginald Malcolm Hincks, 1917-1971; no way found to choose among them. RUGARLI, GIAMPAOLO. 1932-2014. (Adding the death year for the author of “The Crux”, a 1990 novel in CFIV in translation.). SCOTT, HARDIMAN. Note: His birth was registered as Jack Hardiman Scott, while his death is under both Peter and Jack Hardiman Scott, so apparently Jack was his actual first name but he preferred Peter. SENSENIG, GARY PAUL. 1950- . Pseudonym: Hy Conrad, q.v. SHERMAN, CHARLOTTE. Jory (Tecumseh) Sherman, 1932-2014. SIEGEL, DORIS. Born Doris Genevieve Taylor in New York City; married William Ely Siegel in 1932; died in Santa Barbara, California. SILVER, RUSSELL GORDON. 1910-1954. See: Russell Gordon. SINCLAIR, OLGA (ELLEN WATERS). 1923-2014. SMITH, HOWARD W(ILLIAM). 1895-1962. Born in Denver; died in New York City; received D.Sc. from Johns Hopkins University School of Hygiene and Public Health; Professor at New York University College of Medicine. SMIITHIES, MURIEL HOWE. 1912-2010. Died in Ambleside, Cumbria, England. (Correcting the birth date and adding the death year for the author of three novels in CFIV under the pseudonym Muriel Howe.). SMYTH, WALTER (JOHN). 1887-1970. Born in Norwich, Norfolk, England; sailed to New Zealand in 1906; worked in advertising; lived mainly in Christchurch, where he died. SPENCER, GEOFFREY. Add pseudonym: Michael Chesney, q.v. STANNERS, HAROLD. 1894-1958. See H. H. Stanners. STEPHENSON, (WILLIAM) RALPH (EWING). 1910-2010. STUART, SIDNEY. Add pseudonym: Sylvester Avantiere, q.v. THOMPSON, THOMAS M(ATTHEW). 1960- . ULMER, MARI (WEDIN PRIVETTE). 1932-2013. (Adding the death year for the author of “Midnight at the Composanto,” a 2000 novel in CFIV. URQUHART, (WILLIAM) MACGREGOR. Add pseudonym: Max Hart, q.v. WARREN, CECIL. Delete entry (not the real name of Cecil Haworth/Cecil Raworth). WASS, ALBERT [ALBERT WASS DE CZEGE]. 1908-1998. A new entry, not in CFIV. Born in Valaszut, Hungary, in an old aristocratic family; prolific author of novels and short stories; lay protestant minister; came to the U.S. in 1951 and lived on a farm in Ohio; wrote radio scripts for broadcast into Hungary by Radio Free Europe; divorced and married an American woman in 1952; moved to Astor, Florida in 1952; managed the language laboratory at the University of Florida for 12 years; died in Astor, Florida. WASTENEYS, LADY. 1864-1931. Born Julia Marianne Fardell in Lincolnshire, England; married William Wasteneys in 1875; he assumed the long extinct baronetcy of Wasteneyes in 1887; they traveled widely, and separated and sued each other repeatedly; she became a well-known philanthropist and convert to Buddhism; died in her home near Brighton, England.. The Alleged Great Aunt. Correction: completed by the two women authors. WEST-WATSON, KEITH CAMPBELL WEST. Add: eventually returned to New Zealand, where he died. (Amending how the name should be shown, adding biographical detail, and giving information about the only title in CFIV by this author. WHEELER-NICHOLSON, MALCOLM. See also: Robert Wallace (“The Daggers of Kali”). WILLIAMS, E. P. 1929- . Pseudonym: Richard Hope, q.v. WILMETTI, JOE R. Kathleen (Mary) Maruschack, 1939-2013. WILSON, ALEXANDER (DOUGLAS CHESNEY). Add pseudonym: Michael Chesney, q.v. WILSON, GREGORY. Add pseudonym: Michael Chesney, q.v. WRIGHT, ED(WARD) E(VERETT). 1859-1944. Author, poet, and lawyer who practiced in Iowa from 1883; born in Harrisville, Ohio; died in Brooklyn, New York. WRIGHT, LAURIE ROBESON. 1934-2006. Born in Alameda, California; died in Asheville, North Carolina.